Site got hacked last week by some nefarious Russians. Sincere apologies if you experienced some difficulty in accessing the site! So, I thought I’d pretty much seen every bacon product ever made. I actually have a backlog of bacon-y products to review, eventually. A bacon cellar, if you will. But I never expected to see this. 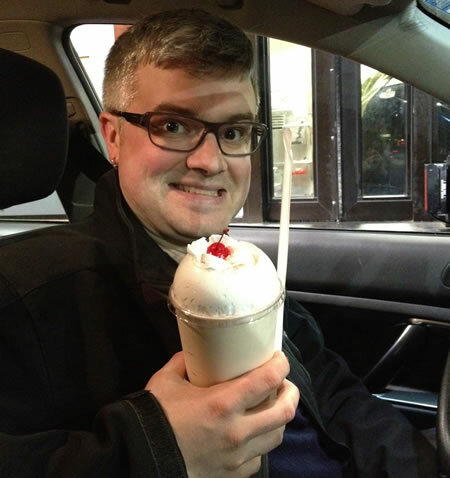 As Jack in the Box anticipated, my first reaction was, “hoax.” But then I saw it on Facebook. Where, you know, everything’s fact-checked. Don’t believe me? Check out their stupid Flash web site, where you can also see … oh, wait, I can’t link to anything. 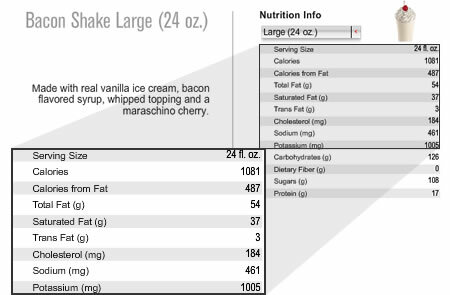 Very well, here’s the nutrition info, screen-captured so you can see it. If you’re wondering, that’s about twice as many calories and fat as a McDonald’s Big Mac (PDF). And that’s probably not a good thing. 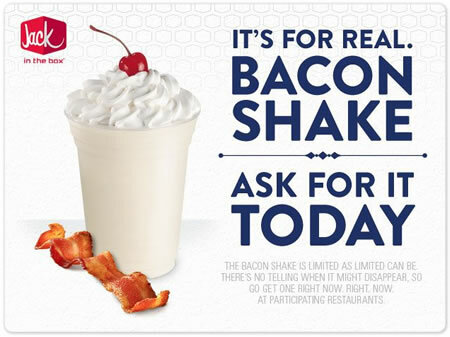 But, like normal, warm, solid bacon … is the Bacon Shake a “worth it” treat? I think you can probably guess my answer, which has nothing to do with the fact that Bacon Shake contains no actual bacon (only “bacon syrup,” which I assume is this Torani product – double ick). The initial hit isn’t bad. Sweet, a little bit of salt … caramel. Kind of a poor man’s … salted caramel, with just a wisp of campfire. But once you stop suction on the straw, the gates of hell open, and your mouth is filled with the plaintive cries of a million charred demons. Rubber charred demons. Start sucking again, and the sweetness wipes away the fake smoke flavor. Stop … and the blackened hands grasp once more at your taste buds as they try to escape your gaping maw. Am I exagerrating? Maybe a little. Not much. I say “save yourself the $3.89 and get a baconator.” Made with actual bacon, about the same fat content, but a few less calories. Did I mention it’s actually made with bacon? Not great bacon, but actual bacon. Factually. Today marks the 1-year anniversary of Don Younger’s death. For those who don’t know, Don was the owner of the Horse Brass, Portland’s legendary beer bar. And that’s telling it lightly. It’s a mecca, with some of the world’s best, most rarest beers on tap. He collected friends in the brewing community like this guy collects miniature liquor bottles. Brewers would always set a keg of something special aside, and Don would put it on. I wrote a lot more about my recollections of Don over on my failed 999 Beers blog, and guest BS’er Chris Tacy actually bar crawled with him a few years back. Good background reading. But I’m writing to tell you about a beer I’m drinking right now. It was Don’s. I made it to his estate sale on the second day, and most of the good stuff (if there was good stuff – Don had dissimilar taste in beer to me) was already gone. But there on the shelves, I found something dusty and … curious. 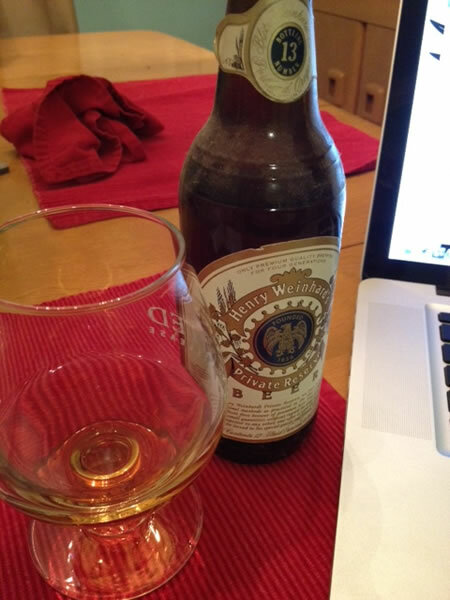 A six-pack of Henry Weinhard’s Private Reserve. Bottling number 13. This is not a beer you’d normally age, so it must have had some significance. Or not. When I die, I suppose people will find lots of things around and wonder why I kept them. That G4 in the basement, for example, circa 1998. Equally dust-covered. The label says “only premium quality brewing for four generations.” So maybe it’s one of the last brews from Henry’s before Miller’s takeover? That was in 1999. This could be a 13-plus-year-old beer. Or not. Marketers can be … misleading. I can tell you one thing – there’s no born-on date. Nor is there any carbonation. The cap was a bit tarnished, and the screw-top never was a reliable barrier for gases in or out. No sound at all when I opened it. It is absolutely clear, though. No sediment in the bottom, either. Guessing this, like its present-day descendants, is not bottle-conditioned. And the taste? It’s faint. Just a hint of wet malt. Very thin. I doubt I will drink more than a sip or two, but it smells nice. Like Fuller’s Vintage, even. But very little actual flavor. Vintage beer-scented water. Rest in peace, Don. Maybe someday you’ll tell me what you were saving this for. Update: one more thought. The bottle doesn’t include a bottle deposit on the label. Oregon’s famous “Bottle Bill,” which added a 5-cent deposit to beer bottles, was enacted in 1971. It’s hard to believe the beer could be that old, though. In November of 2009, I had a wild hair while attending a design gathering here in Portland. Based on some trouble I’d had keeping legible notes at beer festivals, and some inspiration in the form of a custom publishing platform called Scout Books, I came up with 33 Bottles of Beer. 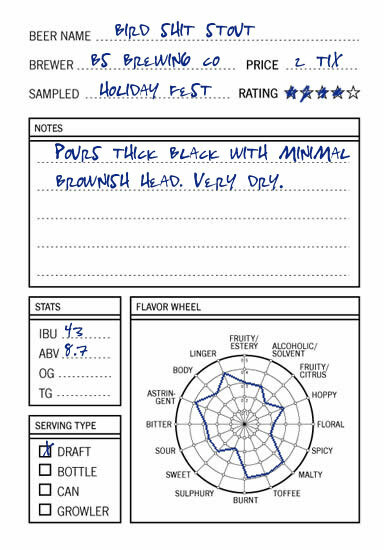 You know, the beer-tasting notebook that’s taking over my life? My main requirement (other than the device being pocket-sized and battery-free) was speed. I wanted to be able to take notes quickly, so I could spend more time drinking, er … sampling. Here’s what I came up with. So I incorporated some quick graphic devices that made taking notes as quick as I could. Think checkboxes. Doesn’t take but half a second to make a tick. But flavor threw me for a loop. Flavor is inherently fuzzy. Not binary, as in “checked” or “un-checked.” There are shades of flavor. Gradients. Spectrums. So, my graphic design brain started firing. How could you quickly describe varying levels of flavor, and do so visually? I ended up with what’s called a “radar chart,” which I call a “flavor wheel.” Some people also call it a spider graph. I think it’s what makes 33 books special (yep, there are wine, cheese, coffee, cigar and whiskey versions, too), and it’s usually the thing people remark on when they look at the books for the first time. But I wondered the other day (I was drinking some 9.4% abv Black Boss Porter) – if I were creating a new beer review book – what might some other tasting notation options be? One option might be “Harvey Balls,” which are used by Consumer Reports for comparative data. Equally quick, but “flavor balls” doesn’t exude … well, it sounds gross. Sorry, Mr. Harvey. And frankly, it doesn’t look as cool. How about a simple bar chart? Elegant, and that might allow for even more gradation. The flavor wheel is kind of limiting, with just five points. This option, which I’ve dubbed “the Flavor Grid,” while a bit longer vertically, allows for quite a bit more nuance – score beers from 1 to 7! That’s … huh … 20% more. Or so. No, way too much ink to fill that thing up. I got tired after just two of the 16 descriptors! And eco-friendly is important to me. Plus, space is at a premium since the books are designed to be pocket-sized. Maybe if I had a little more space to work with, I could come up with something better. Or not.